Whatever Udaltsov and the Russian communists tell us, Grudinin is no socialist. He describes the name “Lenin Collective Farm“ as a brand-name having “nothing in common with ideology or form of ownership”. The Communist party complain that critics are slandering him and in his defence reply, “If he is elected, it [Russia] will be like China”. Using the Chinese ‘model’, in which the most brutal anti-working class policies of capitalist restoration are combined with an extremely dictatorial regime, as an example to follow, is not going to attract youth and workers in Russia to vote for Grudinin. She opposes the present youth mobilisations, which, it should be remembered take place in defiance of the regime’s declaration that they are illegal. She claims that when almost no legal protests are allowed people should not take part in unsanctioned demonstrations. They will lead, she says, to civil war. Instead we should put our faith in people such as Kudrin – for years Putin’s finance minister – in the hope that he can convince Putin to liberalise society. Presenting herself as a supporter of women’s rights, Sobchak’s programme of neo-liberalism would harm the rights of millions of Russian women (she says that former British prime minister, Margaret Thatcher, is her “hero”). 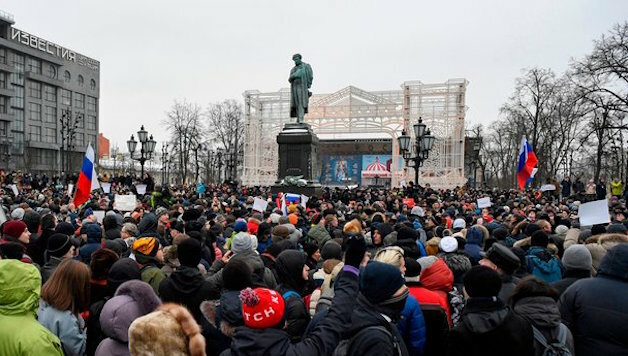 Socialist alternative (CWI Russia) has actively participated in the protests. We support the youth who see the need to protest, while pointing out that for real change to happen the protests need to establish action committees, linked up democratically, in a national structure, and to adopt policies independent of Navalnii’s. All opportunities that will arise in the next few months need to be used by socialists to strengthen support amongst the new layer of activists to build an organisation capable of reflecting the real interests of working people and youth; for living wages and against the exploitation of youth, for decent housing, education and health-care, and to unite to resist divisive racism, sexism and anti-LGBT chauvinism, and to fight for a real change – a socialist change in society.